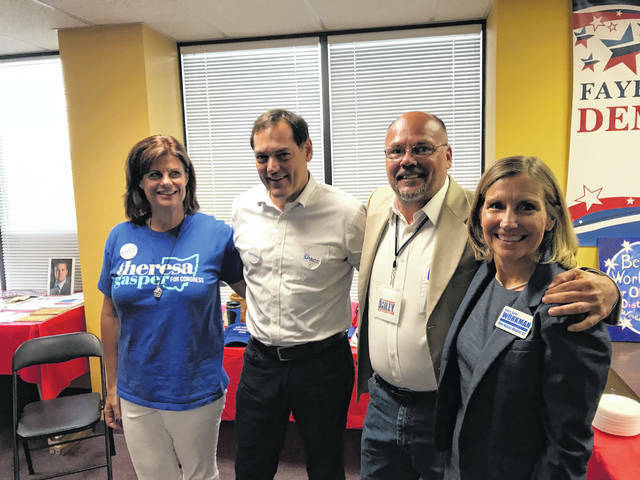 At the recent grand opening of the Fayette County Democrats’ headquarters, located at 153 S. Main St. Suite #1 in Washington C.H., several candidates were in attendance, including: Theresa Gasper, candidate for U.S. 10th Congress District; Zack Space, candidate for Ohio Auditor; Scott Dailey, candidate for Ohio Senate; and Beth Workman, candidate for Ohio House District 92. The Fayette County Democrats are set to hold a candidate “meet and greet” event this Sunday at the Eagles Lodge on Sycamore Street in Washington C.H. Scott Dailey, Democratic candidate for District 17 of the Ohio State Senate, and Beth Workman, Democratic candidate for District 92 of the Ohio House of Representatives, are expected to be in attendance. Workman is running against Republican incumbent Gary Scherer, and Dailey is running against Republican incumbent Bob Peterson. The event begins at 6 p.m. and is open to the public. Those planning to attend are asked to bring a covered dish or dessert. Meat, drinks and table service will be provided. The local Democrats are also planning a live auction and door prizes. https://www.recordherald.com/wp-content/uploads/sites/27/2018/08/web1_4B6F428F-D0DC-4CFA-9C65-73E9225FCA63.jpegAt the recent grand opening of the Fayette County Democrats’ headquarters, located at 153 S. Main St. Suite #1 in Washington C.H., several candidates were in attendance, including: Theresa Gasper, candidate for U.S. 10th Congress District; Zack Space, candidate for Ohio Auditor; Scott Dailey, candidate for Ohio Senate; and Beth Workman, candidate for Ohio House District 92.